How to Fix Runtime Error 216 on Windows? 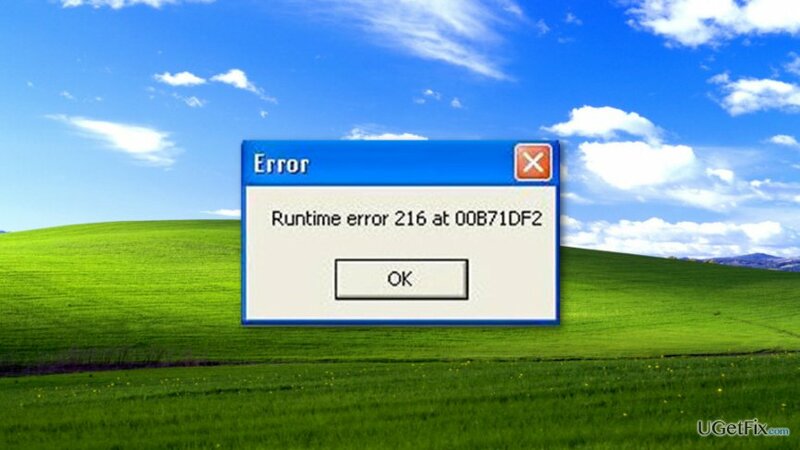 Home »	Fix » How to Fix Runtime Error 216 on Windows? Issue: How to Fix Runtime Error 216 on Windows? I’ve noticed that some of my files have disappeared. No one has access to my computer, so this activity seems strange. What is more, I often receive a Runtime Error 216. I am not sure what it is. Could you help me to fix this issue? Seeing Runtime Error 216 is not a good sign. It warns about the necessity to check your computer’s security immediately. This error message might show up anytime when you start Windows or any other Windows-based program. However, it has nothing in common with corrupted program files or incorrect installation of the software. Nevertheless, runtime errors might identify about various issues with software, bugs and other minor programs; but not this time. This error is dangerous and informs about serious computer infection. Speaking more specifically, your computer is infected with a Trojan. Due to its activities, this error message shows up occasionally. Thus, you need to fix Runtime Error 216 immediately in order to avoid other damage such as stolen passwords, banking or credit card information or installation of other malware. The error is triggered by the SubSeven, or Backdoor.SubSeven, trojan horse. This cyber infection allows accessing your computer via the Internet. The trojan has been first spotted on 1999; though, it has been updated and is still lurking on the Web waiting for the victims. This parasite usually sneaks inside the system with a help of malicious email attachment. The malicious message pretends to be sent from the Symantec Security; however, cyber criminals might have created hundreds of similar lies and claim to be from other well-known companies. Thus, the SubSeven Trojan might be hidden in the safe-looking Word or PDF document attached in the email. Sadly, it’s not hard to get tricked and click on the obfuscated file. When a person clicks on this file, the infection drops Setup.exe executable on the system. Additionally, the trojan might infiltrate the system after downloading an infected file from the Internet or plugging in the external device to the computer. On the affected device, the Trojan unpack a DLL file and make changes in system directory files. As a result, when using your computer, you might often receive the Runtime Error 21 warning. Fortunately, this cyber infection is not hard to remove and get rid of this annoying error. As you already know the reason behind error 216 is a Trojan horse. Thus, you need to remove SubSeven Trojan from the machine. This cyber infection is complicated and dangerous. For this reason, you should not try to detect and eliminate it manually. In order to fix Runtime Error 216, you need scan computer with a reputable anti-malware program, such as Reimage. Once you install and update malware removal program, disconnect from the Internet and other networks. It helps to protect other devices and stop Trojan from spreading further. When security program detects and deletes the infection, you can connect to the Internet and use the computer normally again.